I had the privilege of being a speaker at the TEDxTemecula event October 13th, 2012. My original idea was to address the future of digital with pervading sensors, context all around us and bionic augmentation of our minds and bodies. During the process of preparing the talk, one night, in the spirit of TED I opened my mind to the question of "What could be an idea worth spreading, that is unique, valuable and can potentially change the world?". In the morning I woke up with one image in my mind. 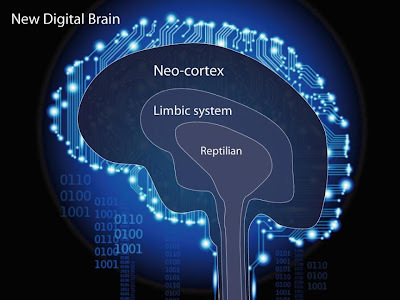 It was an image with the evolutionary layers of our human brain, and the connection that we are witnessing an amazing time in the history of humanity: the development of our New Digital Brain. Great news keep pouring regarding hardware and software improvements in connecting directly with sensors implanted on our brains. Stanford University just published improvements to their BrainGate2 devices particularly on the software algorithm that drastically improved the speed for cursor tracking with their brain implant on chimpanzees. I expect to see sensors and wearable devices to become the super glue that bring the whole planet alive and super connected in ways we never thought possible before. I love to hear the reactions which range radically from "wow! supercool!" to "this is scary!" and "I don't want to give out my privacy!" (angry tone). Let me know what your reaction was! Very interesting (and good job!). I love TED. ;) The ideas presented just make me so excited about the future.